Let me start off by saying I know some journalists find ribbon cutting events to be annoying to cover. One common criticism is these events seem like a photo opportunity for VIPs to pat themselves on the back. Some say ribbon cutting and groundbreaking events are unimaginative ways to earn media coverage. However, if they’re done right, these events can be springboards to comprehensive news coverage about how projects benefit communities. Speaking from the perspective of a former journalist and current Communications Specialist, I would argue that ribbon cuttings and groundbreakings are excellent opportunities to educate the public about what a project means. In the small to medium media markets where AE2S Communications does much of its work, these types of events are a chance for members of the community to come together with local and state leaders to celebrate projects that make a BIG IMPACT. The key to hosting a meaningful event is providing information about what the project actually means to the community. For instance, a new water treatment plant may mean better quality and more abundant drinking water for a growing region, a water or sewer pipeline project may serve rural communities that previously lacked these vital services, and an expansion project at a large business could lead to more jobs in the community. All of these examples solve problems or lead to increased economic development opportunities. Each of these scenarios is extremely newsworthy. In many cases, especially at the opening of a new building, additional photo and video opportunities can be offered to the media such as tours, a closer look at high-tech equipment, and one-on-one interviews with staff who can provide additional context about how the community will benefit. 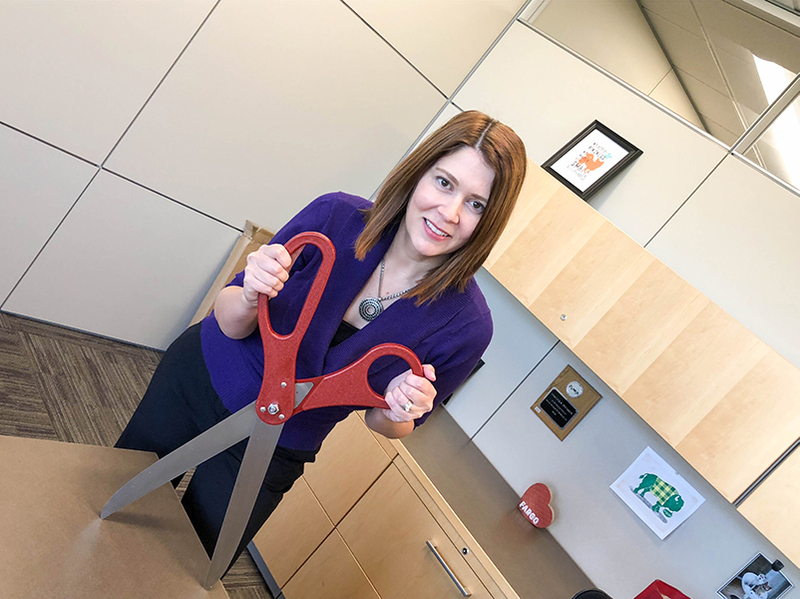 My final argument in favor of ribbon cuttings is that giant scissors make EVERYONE happy. I haven’t met a person yet who doesn’t get excited about picking up comically large scissors. Okay, I’m talking about me – I love giant scissors. For those of you who are really averse to using ribbons, giant scissors, golden shovels, and hard hats at events, there are other options. I have created video and photo opportunities without any ribbons or shovels. At one event, we had the project’s stakeholders turn a spigot that filled a giant drinking water reservoir. At a water treatment plant expansion celebration, we invited the Governor of North Dakota to ceremonially start up the new treatment process with the click of a button on an iPad. The reporters and attendees gathered were able to hear the equipment fire up and see the water move through the plant. It was exciting for everyone. Whether you host a standard ribbon cutting or you decide to get more creative with your video/photo opportunities, the key is to provide context along with the visuals. This will ensure your attendees, including the media, leave the event with knowledge about how the community will benefit from your project. NextI’ve Been Misquoted! How Can I Fix it?